As the time frame of the 400th look backs makes its way forward, there will be a lot of things to do in preparation for celebration. Too, though, there will be a lot to learn. We could start by pulling together our view of the Dorchester company under whose auspices Thomas and Margaret made their transition to the New World. And, getting a proper focus of the company would require us to know a whole lot more about Rev. John White. We have mentioned the Reverend in several posts, so far. These had him as a focus. 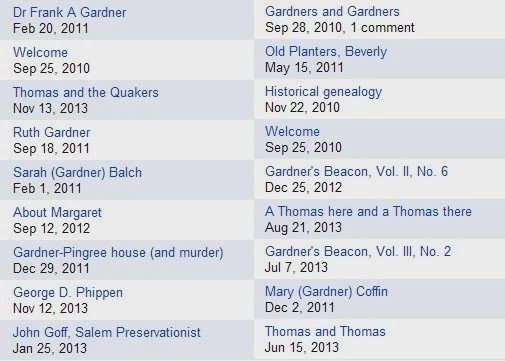 White and Gardner family contributions (2011) -- John Goff uses the day of Thomas' passing (Dec. 29th) to write about the relationship between the families. This relationship was not brought out in the Great Migration series' look at Thomas. Too, one Dorchester writeup does not show Elizabeth White having a son named Thomas. Several questions will be proposed related to these early years, and we'll pay special attention to noting what is known (Example: How many wives?). 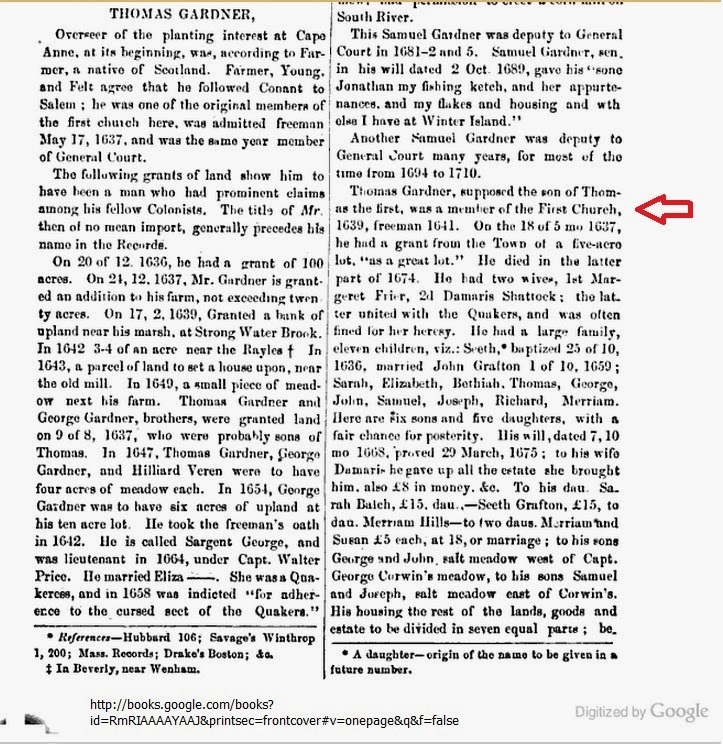 Gardner and Conant families (2013) -- We know that other relatives of Rev John came over. This post deals with one of those families (we will be listing others). Given the two families in focus in the post, we can see that a lot more is known about the pre-move life of Roger; how can we fill in information about Thomas? 400th, again (2013) -- One of the churches that the Rev was associated with has a nice website with interesting details. See below for more on that. As we saw with 400th post, information is starting to appear about the company and Rev. John White. Today, I noticed that they have the Rev as a great-grandfather of John Wesley who founded Methodism. There is a biographical sketch of Susanna Wesley, John's mother, in a compilation of her writings that was published, by Oxford, in 1997. Her mother is noted as Mary (?) White (d. 1693). The next Gardner's Beacon issue will start a closer look at the company started by Rev John. 10/30/2013 -- Note the addition of the Viewpoints category. These may split by topic, but there are all sorts of things to research and to document. Viewpoints? Yes, consider it like the multiple basic views of our underlying reality (yes, interpretations abound). Look, for any situation, we can befuddle things (fuzzify, if you would). Some things are more set (say the Royal births that were witnessed so that there would be no switching of infants -- thanks Dr. Lucy Worsley - see Tales from the Royal bedchambers) than are others. But, even as paternity issues can show, it doesn't take much to muddy the waters. So, genealogy is a matter of providing strong arguments backed up by, hopefully, inviolable bits of history (all inclusive, including administratively handled pieces). 09/26/2014 -- Rev. John White, the Patriarch of Dorchester. 07/14/2018 -- Need to update pointers to the Dorchestor work (et al). It moved from ancestry. http://www.opcdorset.org/fordingtondorset/Files/DorchesterRevJohnWhite1575-1648.html Notice, in looking at his sister, Elizabeth, there is no son Thomas Gardner. Dorset County page on Rev. John White. While reading through Massachusetts Soldiers and Sailors in the War of the Revolution (MS&S, a 17-volume compilation authorized in 1891 - see below for on-line access to all volumes), I was struck by several things. For one, how can we thank those who put together this wonderful resource? The page count is above 17,000 which represents the effort to identify the patriots in one area (Massachusetts). For instance, New Hampshire's patriots are not included, though Maine is well-represented. Too, the Gardner listing (Volume 6) starts on page 258 with Aaron and ends with William on page 282 (not counting other spellings, such as Gardiner). 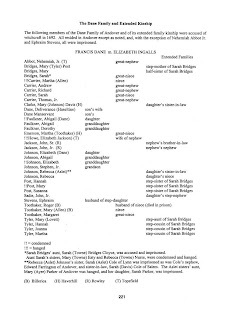 Then, one has to wonder which of these are descendants of Thomas and Margaret (finding out can be put on the task list; the thing would be to start with those that Dr. Frank identified). I got to MS&S as I was looking for patriots who were identified in a tree but did not appear in the D.A.R. database (see below). D.A.R. adds patriots when a new application proves the pedigree and provides the service record. D.A.R. suggests that people who were born between 1710 and 1765, as a rule, might be eligible as patriots if they meet the requirements. Given someone born mid-1900, that would be 8 to 9 generations back. Given that women can be patriots, too, there could be 256+ people on that person's tree who are possible D.A.R. patriots. Of course, various factors reduce that number to something like 30, or so, for the max (assuming that you can prove the lineage and afford the genealogical fees). The number is large enough to keep on busy for awhile (lifetime?). The D.A.R. effort at a database is nice in that it will provide proven lines and allow future researchers to do tree matches to fill in holes. The DB is available for search by the public at the following link. 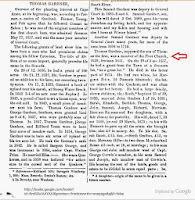 Searching with "Gardner" for 'Ancestor Last Name' brings up 162 hits. That's a good number as there are about 7 or so people per page, for 24 pages. 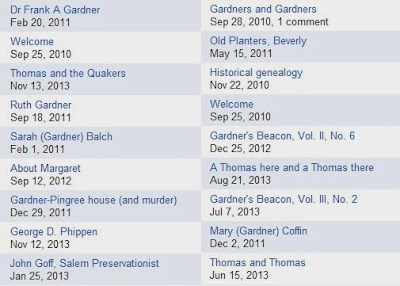 Does that indicate that the Gardner descendants have been fairly active in applying to D.A.R., as a whole? 06/05/2018 -- Referenced in Gardner's Beacon, Vol. VIII, No. 1 (June 2018). Note: See below, for Table:The Dane Family and Extended Kinship from TEG 19:221. With the turn toward fall that comes with September, all sorts of things loom on the calendar. For one, those festivals related to harvest, such as apple cider (ah, Johnny Appleseed ought to be remembered every year) and such. Too, Salem rises to public attention, again. Would not Thomas (Beacon Vol. I, No. 4) want us to be interested in anything dealing with his town? There was more than Salem Village involved with 1692. For instance, Andover was an important town, too, which we'll get to below. It might be nice to stop, recognize the Associated Daughters of Early American Witches and look at their accepted ancestor list (not considered complete). The ADEAW list was used for the "Imagine a meeting" post from 28 Oct 2012 (follow up post on 10 Feb 2013). That first post commented on, and showed examples of, the inter-relationship between ancestral families on one person's tree (it was not a complete listing and was presented only for discussion purposes). 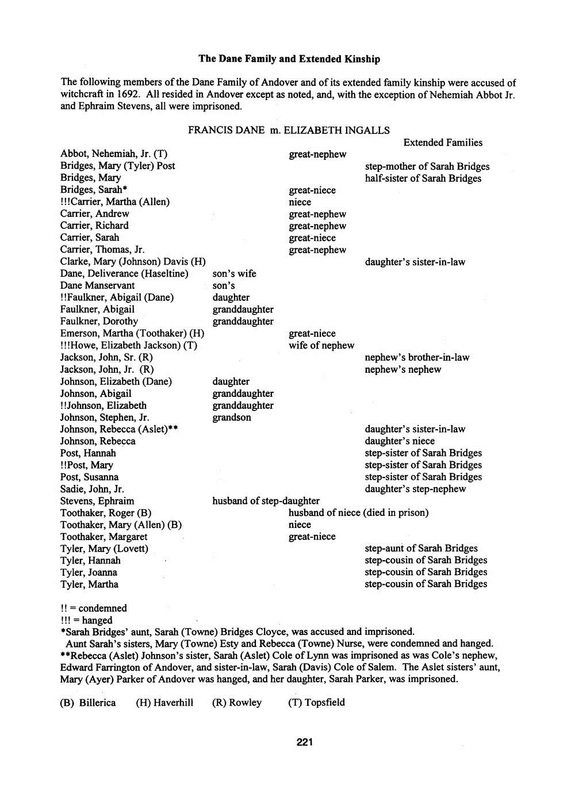 Today, while searching on NEHGS (it's nice to find well-researched papers), I ran across a paper by Marjorie W. Otten (1999 - TEG 19:221) who was writing about the Ingalls/Dane families. Of course, Rev. Francis Dane (see list from 28 Oct 2012) was mentioned. On looking at the article, I found an interesting little chart in which Marjorie enumerates those in Rev. Francis Dane's extended family who were accused of witchcraft (and, for the most part, imprisoned) during the time of the craze. Now, we know that Rev. Francis Dane was critical of the authorities. From the list, one might get some notion of why this was so. His cohort, Rev. John Wise (another person on the tree), was on the opposition side, too. From what I've seen, Marjorie has studied, and written a lot, about the events of 1692. So, given her expertise and scholarly way, it was good to see a listing like this. Perhaps, we would learn something if we had this for all of the families who were there (say, think of an exercise to help fill in one's tree - or, get a new respect for those who were tormented). Not only were families persecuted, so too, their associates and friend would have been deeply troubled. Aside: Think of the six-degrees analysis associated with Kevin Bacon to get an idea of the magnitude of relationships that could be collected if transitivity were carried out beyond immediate ones. It's early, but, we'll have to consider the Salem Village theme, again, this year. 09/04/2013 -- Again, the scene is built as follows. Those who came over are from the 10th to 15th generations back (for the most part) for someone alive now. By the time of 1692, lots of the earlier arrivals had passed on. So, that left the second generation (again, for the most part) as the elders. Now, taking a cohort mix (generational cut) round or about 1692 would give us someone on the current person's tree who would have about three generations living (including the level of their own cohorts). So, we would see siblings/cousins, parents/aunts/uncles, and the greats. In other words, it's a composite person that is built from that cohort mix (meaning, of course, that being on the tree implies ancestry) for which we can identify relationships blood (including 1/2 blood), in-law, and even friends. What Marjorie's chart does is to take someone who is in the mix and look at extended relationships. Now, consider what we would have if we did that for a large part of the composite mix. Would it not be an interesting view? 10/15/2013 -- The article was about the extended family of Rev. Francis Dane. The image can be updated for other families. Doing one of these would be a interesting exercise, say for a Dane descendant. That is, someone from about three generations ago who is a descendant of Rev. Francis' father, Dr. John. 10/20/2013 -- Added note at top, which is referenced from Wikipedia article on Francis Dane. 10/30/2013 -- I am in the process of reading Katherine Howe's book, The Physick Book of Deliverance Dane. Dane, as in being related to Francis, of course. I wondered if there would be motivating material for a Beacon issue (we did have 1692 as a theme in 2011 and 2012). It is an interesting plot, especially the balancing of the characters, and their interactions, in two time periods is nice. The description that Katherine provides of little Dorcas Good in the underground cell surely depicts the poor, young thing's misery and shows Katherine's grasping of the horror. One wonders, from some of the modern views and comments, if people really understand the dire situation. Too, the main hypothesis might have some truth, in a slightly altered construction. You see, science has not shown as much light on human matters as some might think. But, then, for any knowledge that we have gained, we have also seen that the unknowns do not diminish. It's just that we get better able to cover (as in, remove from awareness) the holes in which lurk the demons. 05/16/2015 -- anceSTORY's article on Mary Perkins Bradbury. 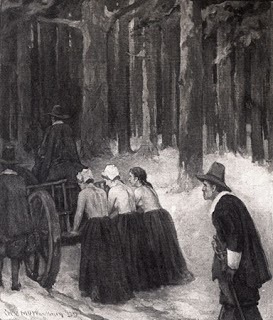 10/10/2018 -- Pulling together the posts related to the witch trials for future discussion. Heather Rojo's comments about the recently-aired WDYTYA (Cindy Crawford) are interesting. Heather mentioned one person estimating that the show required 1000 hours of research, supposedly by experienced researchers who had access to information beyond the normal person's reach. That's about 1/2 a person-year, by the way, for those who have had any dealings with planning. In terms of weekends, one would have to spend about 10 years or so (more or less, okay?) to get that amount of work done. I did read of one person devoting his life (and, I'm not talking cousin-in-law, Walter Goodwin Davis, who had an inheritance) to genealogy; he read the principle resources at many places and did transcriptions). Aside: One has to wonder about those 1000 hours. How they were spent? How many hours were related to following false leads (which, by the way, are useful to the watchful researcher)? From our view, Dr. Frank's work was priceless. How many hour hours did he spend? Quite a bit, no doubt. As another example, I can point to a D.A.R. genealogist who helps people with their applications (she spent over 100 hours, in one case). Then, William Reitwiesner is a prime example (wargs.com) of working outside of the limelight for decades. He liked his day job at the Library of Congress since it gave him ample time to do genealogical research. Shows like WDYTYA are nice in that viewers can think about their remote cousins (or ancestors). Also, it's good to see the experts in operation (in the background, mostly, in the later versions of the show - say, as compared to how it was for Brooke Shields' episode). And, it does get the interests up (modern/western views discount ancestors even though the basis for our biological being is thusly laid - too, ancestors are "closer than our shadow" (attributed to your's truly, unless there was precedence) -- it's a meme thing, folks). So, it ought to be evident that this type of thing takes work. It's nice when the results of such work is available to the next set of researchers. It is one of our goals to foster research and to provide verified information. Of course, this all presupposes some way of presentation that is accessible. NEHGS has done a good job. As a research member, one has access to many on-line (digitized) resources. Too, one can go to the library and grab books, many times. And, one has to be thankful for organizations, such as D.A.R. Their verified trees are a great resource for future work, such as matching up trees to find missing siblings, etc. This is not true for ancestry.com, unfortunately (in general, let's say; there are plenty of folks there who have sourced their stuff). Actually, I always filter on rootsweb for hits that have sources just to see how much a solution set is reduced thereby. But, un-sourced can be useful, say, for hints on how to proceed. By the way, I have found familysearch.org to be very useful. Aside: The tree being used has the living person as root point. Then, the ancestors are leafs. And, this view would have duplicates to account for the fan-in of inter-marriage (cousins marrying). So, hypothesize some leaf (say, one of those in a gateway list that Heather talked about), then one has to show reach-ability in the tree from the root to the leaf. In an ideal world, all of the nodes would be strong. The case is that some nodes may not have solid support, yet they are rationally supported. Case in point? If you have a gap, coming at it from both sides will allow one to see if there is a bridge and what is needed to support the bridge. The error in the book was where a gap was closed by collapsing a generation (or, rather, ignoring the absence of a generation which forced a fit of the ends). 09/04/2013 -- Topic carried over to truth engineering. 08/30/2013 -- With the post, I didn't fully cover the resources topic. But, I'll get back to that. I was browsing a book today that deals with the ancestry of Charles II. He's the hippy king, so to speak. Dr. Lucy Worsley (who has wonderful videos, by the way), says that things were shaken up more in 1660s (Charlie's time) than in 1960s (which might mean a thing or two to the boomer generation). Well, Charlie II's tree was full. However, by the eighth generation there were holes which carried further out. For most people, their chart would have large gaps. If someone knows of a tree that is almost fully filled (to 11 generations, let's say), please let me know. 08/29/2013 -- Having said all that, here is an exemplary site, again. We have Benjamin's son, Charles Sanders Peirce, the logician and pragmatist, on our descendants list. I had run across the work of Charles in my younger years in an academic environment and found his work to be useful throughout my working years. So, Charles had to be on the list when I ran across his name while doing descendants searches a while ago. Today, while researching the Quaker involvement of the Gardners (note earlier John Goff article), I ran across this memoir by Charles' father, Benjamin Peirce. The memoir can be found in the Essex Institute Historical Collections. Benjamin Robert S. Rantoul read this memoir at the May 16, 1881 meeting. Here is a link to the digitized version (points to pg 172, where the charts start) of Memoir of Benjamin Peirce [1881, Essex Institute Historical Collections], at Google. 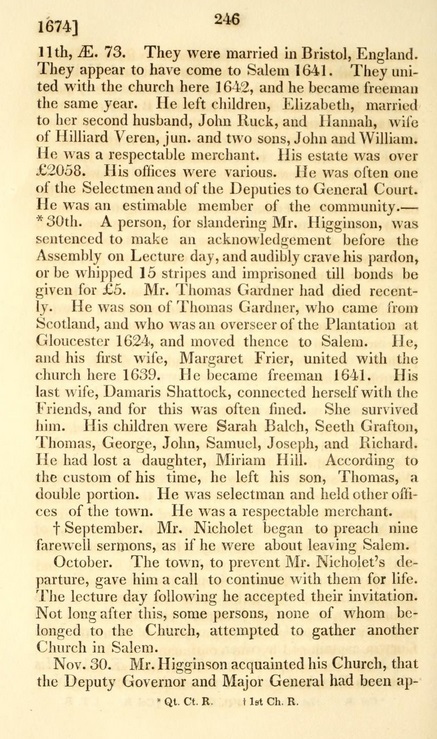 The image shows part of page 172 which deals with the earliest generations in colonial New England. I thought the whole chart to be interesting due the familiar families. But, the Gardner part of the tree is especially interesting. I'm doing this post to add to the material related to the early Thomas Gardners (see last post). In fact, there may be several of these as we look at what is behind the different viewpoints and assess how to clarify the matter for future researchers. Aside: I recently ran into an error that is in a known book. This error has been propagated widely. Now, I have established the problem. From a brief search, some know of the problem; many others seem to not to have stumbled upon it. But, you know, those who have skirted the problem didn't leave any marker for later travelers. Why do we have to let people fall into the quicksand themselves? There ought to be some published errata that is available for access (perhaps it exists already somewhere). Of course, web-based presentation is implied here. I still rankle at the notion that Gutenberg's technology is the forever means for publication. It may be that people are saying that fluidity is only one state of matter; as in, we need to solidify things (which is what print does) now and then, even if it just allows a snapshot of a point-in-time state of knowledge. 12/03/2017 - Benjamin died in 1880. The Memoir was read by Robert S. Rantoul. We will see him, again, as he was a contributor to Dr. Frank's The Massachusetts Magazine. 08/03/2017 -- Benjamin Peirce was instrumental in getting the Harvard school of science and engineering started when Jacob Bigelow resigned as the Rumford chair. 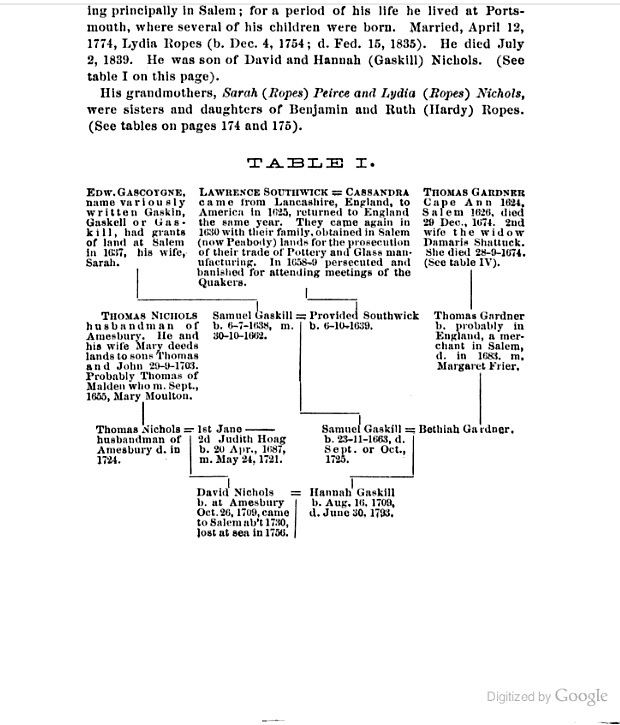 07/15/2015 -- We have a project that is looking at Sherborne, Dorset (note references to records of a marriage of Thomas and Margaret plus baptism of the kids - also, note reference to abductive reasoning which Benjamin's son, Charles, helped establish) as place of origins. As one would expect, there have been many views on this subject over the past 350 years. One of these is expressed in the above image, from Benjamin's perspective. It has son, Thomas, as the one whose wife was Margaret Fryer (see Number of wives and John Farmer's view). ... Not only is Benjamin a descendant of Thomas through his first son, he is also a descendant of Seeth (see Table IV, pg 175). ... An analog of the required method might be paleoichnology (large tales from little data). 08/29/2013 -- WDYTYA episode has an estimate of 1000 person hours having been used for research. This post continues our look at Gardner families and considers only the Thomas Gardners who arrived early. But, first, here are four posts dealing with the subject of Thomas of Salem. They are in order with the latest post first. However, the book that is the principle focus of each post has an inverse order (somewhat, this is the result of taking data items back to their source; if we can grab the complete view, then the correct telling of the story will come to fore). Thomas and Thomas (Jun 2013) - Felt suggests, from his review of the materials, that the Thomas of Salem came over with his father, who was also named Thomas. Felt also notes that the older Thomas came from Scotland. John Farmer (May 2013) - Farmer has two Thomas Gardners in Salem. The older one was the lead at Cape Ann, Farmer says. And, the son who was the husband of Damaris died in 1674. Stories and Unwindings (Oct 2010) - One expects to find misinformation on the web; it's a different thing when such is published. But, first, one has to establish what is misinformation and what is not. Mention is made of Dr. Frank's books and one by William Folger about Nantucket settlers. Too, though, a 1999 article by the Jamaica Plain Historical Society mixes the Thomas Gardners. Gardners and Gardners (Sep 2010) - Dr. Frank's book had a list of the early Gardner families in which there were two Thomas Gardners: Salem (1624), Roxbury (died 1638). Dr. Frank also mentions what he considers an error: that there were two Thomas Gardners (of Salem), the earlier of whom died in 1635 (see image on post from Dr. Frank's book; elsewhere, he used 1638, but are people talking two old Thomas Gardners?). Note: Statements, by earlier writers, that turn out to be less than correct ought not be suppressed. Rather, we need to bring these to fore so that the reasons for their incorrectness is accessible. The cloud/web seems to allow such methods with its large storage capacity. The problem? Given that the proper view is established, where does one put it? Where does a researcher go to find the most-supported view? Now that we have reviewed what has been gathered so far, let's look at the early arrivals, and we can point to the two Thomas Gardners who are mentioned in Dr. Frank's list (Salem and Roxbury). Some researchers have suggested a relationship between these two families. Others seem to have their descendants mixed up. The map is included for those who may not be familiar with the area. Note: The crow distance must be about 14 miles or so. Yet, the terrain would have slowed any movement. Perhaps, the fastest way would be to get down to Dorchester and take a boat to Salem. Nowadays, these two are on an arc, somewhat; one can take a highway in an almost circular path around Boston. That distance is 50 miles or so. What is the true picture? How can we find out? Well, data gathering, analysis, and discussion is one mode that we will continue to pursue. For now, let's use the NEHGS-published Great Migration books. The format of this material that has been followed for all of the principle arrivers is Origin, Migration, First Residence, Return Trips, Occupation, Church Membership, Freeman, Offices, Education, Estate, Birth, Death, Marriage, Children, Associations, and Comments. People who are not handled separately are still mentioned along with a reference to source of the material. As we have said, this series' look at hundreds of people is exemplary in presenting only items that can be supported. That being said, there are other sources that might have enough weight to make a reasonable stab at filling in gaps (as long as they are not too big - formally, interpolation). Thomas Gardner of Salem (died 1674) is covered in the early volumes: 1620-1633, Vols. I-III, pg. 731 (6 pages). His children are as noted by Dr. Frank, albeit with a different placement for Richard. 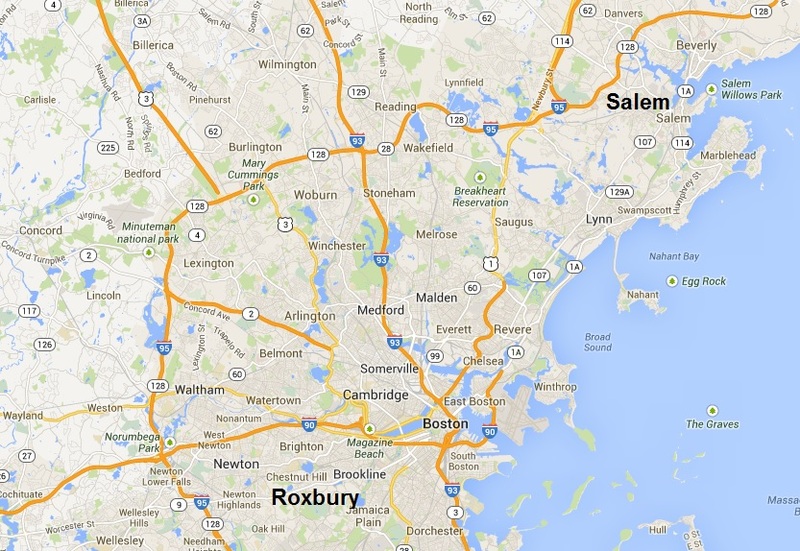 Thomas Gardner of Roxbury (died 1638) is mentioned several places. He is noted as the father of Peter Gardner (died 1698): 1634-1635, Volume III, G-H, pg. 14 (4 pages). (Note: Thomas had several children, including Thomas Gardner of Muddy River who married Lucy Smith). The next thing to look at will be all of the Thomas Gardners that were in the area up to about 1700. To get an idea of how many there were, we can look at Savage: Before 1692, Volume #2, Gardner-Garven. Just in this section, Savage mentions seven Thomas Gardners. Of course, there are other works to consider. 08/22/2013 -- Forgot to mention: nothing new under the sun. 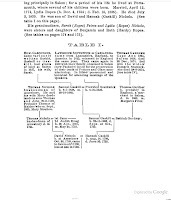 08/21/2013 -- Other works would include contributions by researchers, such as we find from Heather Rojo: Nutfield Genealogy: Amanuensis Monday - A mystery from Rev. Bentley's diary. On-line is not bad, by definition, old genealogists (gosh, I'm 71 and know better than that). Doing research for the next Beacon issue (Spirit of Independence - during Thomas' time) involved a re-look at Felt's work. That is, his Annals has some interesting remarks about interactions of the colonists, in the sense of Salem's crowd, with the old country. Of course, some of his remarks cover the general area, such as goings-on in Boston. The last post, here, dealt with Origins which is a continuing theme. Whence Thomas (and Margaret) is an open issue. Farmer mentioned Scotland; he published in 1829. Felt mentions Scotland and talks as if Thomas' father was here, too (see the image, pg 246). Curious. Now, Felt was a little earlier, 1827, than Farmer. Was Farmer quoting Felt? But, he had sources of several sorts. He was looking at the records and talking to people. Felt's work would have been 150 years after Thomas' death. We'll have to sort all this out. Right now, the idea is to gather. Think of it like using the brainstorming rules of thumb. Such as? Don't knock something during the collecting of ideas round. I'm doing that specifically due to the fact of all of the stuff that seems to have been done, disparate and disjoint as it seems to be. With our access to technology, it's time to do a proper analysis. Too, ex post facto, there won't be book burning. No, anything shown to be without substance will be presented and its faults documented. Aside: Perhaps, the one from Scotland is the senior Thomas. I have looked at material from Dorchester Company. The sister of John White, who married a Gardner, is not shown as having a Thomas. But, is this site the final authority? On several pages early on, Felt reports book burning. Too, there is a lot about interaction with the Friends. Note the Remarks (06/15/2013) in the Origins post where Damaris is mentioned. She may have been excommunicated. Charles II's caution about handling the Friends may have been timely. Thomas' and Damaris' marriage will be looked at, as research for the next Beacon issue will cover the same ground. John Goff has written about Felt. 06/17/2013 -- In the Great Migration write-up, Thomas' origins are noted as unknown. The next Beacon issue will have a theme of the spirit of independence (early look).Also, Anderson, et al (in Great Migration) say that Banks has Thomas coming from Hurst, Martock (supposedly, Banks quoted no source). To date, sources for the blog post and Beacon issues have been textual. The technical resource for these were several, including databases. That is, digitization projects have made many books available. There are several different copies of Dr. Frank's book (my favorite is at archives.org). Various groups, including collateral families, have websites. Some of these use database technology. rootsweb is another example. A few days ago, knowing that we need to upgrade the TGS site to use more modern techniques (let's say that it is now, being generous, late 1990s). I started to look at options. Too, media types abound; genealogy might be dragging its feet (On blogs and other modern means), however presentation of this material will need to grow with advances. The NEHGS' emphasis of the relationship between history and genealogy gives more than enough motivation. So, what if there were something presented about Thomas and Margaret using modern methods. Videos come to mind; too, though, gaming needs serious attention. So, I went looking to see what might be on youtube with regard to the Planters of New England. Essentially, it was disappointing. 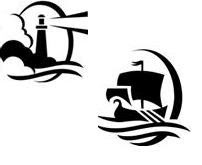 Here are some examples why: Naumkeag, Syracuse series, Endicott, etc. But, then I got side-tracked. I ran across a BBC series on the History of Scotland. I started in the middle and bounced around. Now, some experts harp at the series. To me, it was an eye-opener. As I listened, I went and researched what I was seeing. As well, trying to understand what it might have been like to live then. That is, preparing to address Thomas' decision to leave and to make a live elsewhere. Here are links to the Scotland series on Youtube (the first part) and a Wiki page that summarizes the videos. Is there something similar about Ireland? Yes (Youtube, Wiki). England? Yes, again (Youtube, Wiki). Actually, I was looking at England first. Someone had a series that had little introductions to the Monarchy, in sequence. When I got to Ed I, the Hammerer, I searched on that. The above Scotland series popped up in that the presenter (Scottish) said Hammerers (plural). He added in Alexander (knocking the heads of his own people). While looking at the videos on Scotland, I was paying attention to changes that were coincident with Thomas' time here. I had mentioned that before, several times, such as motivations. Given the annals framework that is being used for the Beacon, we can now do an issue pulling together some of this in a year-by-year fashion. That is, relate things at home to what was going on here. Keeping in mind, please, that we're are still trying to figure out the ancestry of this couple. While looking at the Ireland series, the presenter talked about how James I/VI sent Planters to Ulster. The idea was to colonize the incorrigible Irish and teach them how to be civilized. Disclosure: the tone is set from a mixed heritage, including Irish -- from what I've seen, there are not saints in any of these people - except for St. Margaret, perhaps - but, we still must honor (Commandment - way back to Moses) -- nod to the U.S. Father's Day which is approaching. Too, today it's like the same old thing over and over again. What lessons may we learn from Thomas and Margaret? Finally, but this is just a start, how the English (Elizabeth's bad side was quite apparent, too) thought of the Irish seemed real similar to me to how some settlers felt about the Natives as they arrived here. A lot of these opinions were written, so we have a record. But, recall, if you would, that the Gardners, early on were on a friendly basis (story of John, for instance). Too, are there other videos that we can add to our list? Games were mentioned. Think how the Game of Thrones books spawned off all sorts of things. Our purpose would be to teach the proper history (whatever that might be). 08/07/2103 -- During a period of browsing classes, documentaries, and the like, I have run across many videos (youtube) that apply to our themes. One that I have not watched in its entirety deals with re-creating a Tudor Christmas feast using techniques and tools from the period: BBC UK. I'm putting it here as it nice to think of the cooler holiday period during the heat of August (say, put a snow scene on your desktop). Too, in 2011, the December Gardner Beacon issue had a theme of Tudor Christmas but also asked the question of Thomas' and Margaret's first Christmas here. That Christmas would have been before the heavy Puritan (wet) blanket descended upon those who were able to get themselves free from the old country. 06/17/2013 -- In the Great Migration write-up, Thomas' origins are noted as unknown. 06/15/2013 -- Speaking of the NEHGS, what we are doing is historical genealogy (as of today, that post is the all-time most-read post). Coming in second is Old Planters, Beverly. Looking at origins would encompass the whole bit, out of which would then come the real story. That has not been done, that I can see, as of 2013 is not troublesome. Things come forward all the time. Too, has anyone surveyed the work to date in a comprehensive manner (meaning, of course, scholarly)? One goal will be to start, and sustain, such studies that would augment what has already been done as well as explore holes (which have to be defined, for starters). In the meantime, we'll try to document Thomas' life (such as, pulling out things related to character) and progeny. Also, we ought to look more closely at Damaris Shattuck and Thomas. That he married a Quaker and didn't suffer the wrath of the likes of Endicott says something (Mary Dyer was hung in 1660). 06/14/2013 -- As an afterthought, I ought to have used Barbarian in this post. Wiki has a nice little write-up on the term and its usage. While mentioning Wiki, please visit the Thomas Gardner page. It's a little over three years old and needs to be modernized (brought up to date - civilized? ), too.